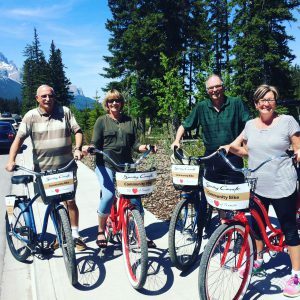 The great reasons for making Spring Creek your Canmore neighbourhood of choice are far too numerable to tally, yet here’s one more that you can add to the list: our new fleet of complementary community bikes! We have eight fantastic townie-style bikes available for owners and guests to use: four in fire-engine red for the ladies and four in cobalt blue for the gents. These fun and flashy bikes are great for running errands, grabbing lunch or just cruising around town. For ease, comfort and practicality, each bike has a height-adjustable seat and comes with a basket, helmet and combination lock. Our new Community Bikes Program makes even more sense when you consider all the ‘cycling infrastructure’ right here in our neighbourhood: paved pathways, gravel trails, three pedestrian bridges, numerous bike racks and a bicycle maintenance stand. We’re definitely a cyclist (and pedestrian) friendly neighbourhood! 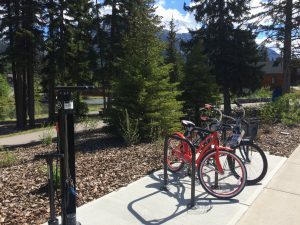 We’re also proud to be part of Town of Canmore’s bike-friendly community incentive programs and initiatives. 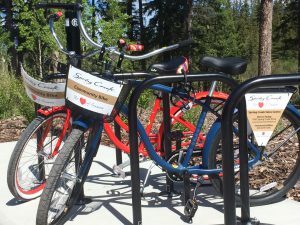 For more information on how to access the community bikes, please call 403.678.5108 or visit the Spring Creek Vacations Office at 379 Spring Creek Drive, Rundle Cliffs Lodge.